The UK crowdfunding market is the leading, and most successful, crowdfunding market for several reasons. Arguably the primary reason for their success is that the UK tailored, and continues to tailor, their securities laws specifically to promote crowdfunding/P2P lending. A lesser known reason however, is the availability of certain tax incentives for angel investors. Tax incentives which the U.S. currently does not, but certainly should, have available. It’s said time and time again (especially during election times like now) that investment in small businesses is crucial to the economic growth and welfare of the country. It fosters innovation, it creates jobs and it keeps us moving forward. Hence the impetus for the JOBS Act, and the multitude of other state and federal legislation, which are intended to foster small/new business investment and development. Investing in small and early-stage businesses however, particularly start-ups, is extremely risky. There is no denying that. Early stage investors face substantial investment risks including uncertainty regarding the company’s concept/product, marketplace acceptance, scalability of the business, availability of follow on funding, etc. However, it is typically these exact businesses that are in the most need of funding (e.g. seed and growth stage funding). Therein lies the dilemma – How do you encourage people to invest in companies at a time when they are at their most critical, yet riskiest (from an investment standpoint), juncture? Investment based tax incentives offer one proven answer to this riddle. The potential for reward is one thing, and we know that being an early stage investor offers the potential for well above average returns. Remember the risk vs reward graph in Economics 101? Certainly the potential for high return provides a certain inherent incentive to investors, but these returns are neither immediate nor certain. Such intangible rewards alone will typically attract only the most risk tolerant types of investors. Similar to the types of people who might be likely to bet their entire chip stack on one hand of blackjack for example (don’t judge me!). Certainly the upside is appealing but if the hand goes wrong they leave the table with absolutely nothing; except a seriously expensive “free” drink of course. On the other hand, if you want to attract more risk-averse types of investors you need to offer more than just the intangible potential for high future returns. This is where investment based tax incentives can be the most effective. Now when I talk about “investment based” incentives, I am referring to tax credits and other incentives that are based on the amount of money a person invests which can be used at the time of investment in the company. These are different from tax incentives based on the amount or type of gain/loss an investor ultimately recognizes in the future when they sell or transfer their investment (i.e. “income based” incentives). The primary difference between the two is that income based incentives only serve to increase the upside potential of an investment (i.e. increases the ultimate potential reward) which, as discussed above, will only serve to attract a certain kind of investor. Investment based tax incentives on the other hand, give the investor some downside risk and can actually make investment in early stage companies more attractive to risk-adverse investors. Essentially, with investment based tax incentives, an investor will receive an immediate credit against their income taxes equal to some percentage of their aggregate investment. By doing so, the investor knows that, whether or not the company is ultimately successful, they will never lose their entire investment (i.e. because the already got back the amount of the tax credit). Carrying my blackjack example forward, let’s assume that when I, I mean my friend, made the wager on that one hand of black jack, the casino gave him 25% of his chips back before the hand was ever dealt. Win or lose the hand, that 25% instant refund makes that bet significantly more palatable because it is money he can now leave the table with if the hand is a looser. Moreover, such a strategy would increase the probability that more risk-adverse players would sit down and make similar bets. Just imagine how many people might try the same bet if the house gave back 30%, or even 50%, of the wager up front? Now you might be saying to yourself “if that is so true why don’t casinos actually employ such a strategy?” The short answer is they do. It’s just not as blatant as handing back chips to players, taking the form instead as reward card programs, 2 for 1 slots, and free buffets. Further, this incentive strategy is neither new nor isolated to casinos either. It’s the same reason why credit cards give “cash back” incentives, and why companies like Ebates.com exists (boom…mind blown). When people are able to get instant money back they are more likely to make the investment/purchase because their downside risk from a bad investment/poor purchase has been reduced (i.e. they feel safer). This is reason why investment based tax incentives have been proven to be such a strong method for encouraging early stage investment. The UK has long embraced the power of investment based tax incentives to encourage early stage investing and with great documented success. 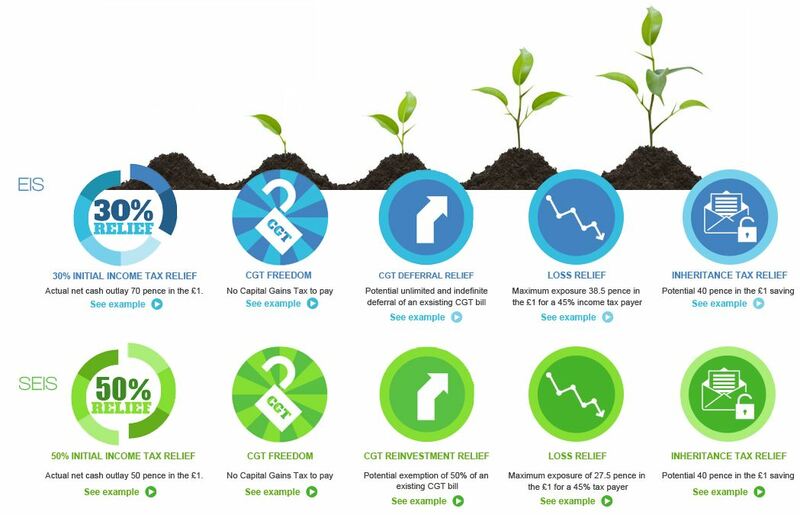 Among the most prominent of these tax incentive programs are the Enterprise Investment Scheme (EIS) and the Seed Enterprise Investment Scheme (SEIS) programs. The EIS program is intended to foster investment in higher-risk small companies while the SEIS, which was added as a complementary program, is intended to specifically encourage investment in start-up/seed stage companies. Let’s be clear, not every small/early stage business in the UK is, or will be, eligible to participate in these programs. A company must apply for qualification with the governing authority (i.e. the Small Company Enterprise Centre (SCEC)). Moreover, there is a laundry list of qualifying requirements under each program that must be met; including, among others, requirements concerning the company’s size/asset value/number of full time employees, amounts of previous funding, and intended use of the investment proceeds. A detailed description of the actual workings of the EIS and SEIS programs is well beyond the purpose of this article but the point is that these programs offer significant tax incentives to investors in qualifying early stage companies and small businesses. Most notably, in the scope of this post, these programs offer an upfront tax credit to investors equal to 30%/50% (respectively) of the amount of their investment (subject to certain annual maximums) which can be generally taken in the tax year the investment is made (subject to certain restrictions). That is a HUGE incentive because it literally cuts the investor’s downside risk in half! – ok, it only cuts it down 30% under the EIS program but you get my point. Now whenever a discussion of tax credits comes up critics are always quick to say “there is not enough evidence to prove that tax credits actually increase investment.” Well the good news for us, and the bad news for critics, is that there is significant evidence to prove that the UK programs are working as intended. While the SEIS program is relatively new having only commenced in 2012, the EIS program has been around since 1993 giving us a wealth of data evidencing that the program works. In fact, according to data released by the UK government in April of this year, between 1993 and 2015 over 24,500 companies have taken advantage of the EIS program (approx. 1/3 of which were raising funds for the first time) for a total of £14 billion in funding (roughly $20.4 Billion U.S.D.). Hmmm, $20 Billion U.S.D. invested over a 22 year period certainly seems like a success to me, what do you have to say to that critics? Of course, critics might respond with something like “well just because these types of programs are successful in the UK doesn’t necessarily mean they would be successful here in the U.S.” Such an argument might have some merit if investment based tax incentive programs weren’t already being successfully used in the U.S., but they are. While a federal level tax incentive does not currently exist, about half of the states currently offer some form of state-level investment based tax incentive for angel investors in amounts ranging from 10% to 100% of eligible investments. Now before you get too excited, I should mention that the majority of these programs are not nearly as flexible as the UK programs described above. Each state has their own unique rules and regulations which must be met in order for a company/investor to qualify under the program. Additionally, the credit is often only available to certain limited types of companies; typically those focused on new “innovative” forms of technology and/or “research and development” (unless you are in Indiana of course, where focusing on “professional motor vehicle racing” is oddly also one of the limited qualified categories). To make matters worse, most of these laws do not work well, if at all, with new crowdfunding options. This is the reason why I am currently working to change the Illinois Angel Investor Tax Credit Program, but I digress. Even with all of these limiting factors these state based programs have proven to be extremely successful in both bringing new investors to the table and in encouraging repeat investments – resulting in 100s of millions, if not billions, being invested in small and seed-stage companies over the last decade. So again, these programs have proven to work as intended, even here in the U.S.
Investment based tax incentives have proven to be a win-win for everyone involved. Businesses benefit from receiving capital at a time when it is most critical. Investors benefit of course from getting the tax credit which significantly reduces the risk of their investment and gives them a tangible, and immediate, return on their investment. Finally everyone else wins as the economy benefits from the increased innovation, employment and spending resulting from these funded businesses. If Congress is serious about fostering small businesses, as it has said many times, then it literally needs to put its money where its mouth is and create a federal Investment based tax incentive to encourage more investment in small businesses. Don’t get me wrong, there are some tax incentives currently available to early stage investors such as Section 1202 which provided or a 100% exclusion of gains on the sale or exchange of “qualified small business stock” (which is specifically limited to “C” corp stock) held for more than five years and Section 1244 which provides for a limited ability of an investor write off losses on the sale of “small business stock” against higher earned income tax. These are nice and all but they are extremely limited in their application. More importantly, they are “income based” incentives which, as discussed, only certain investors will care about. Similarly, state level investment based tax incentives are great but they too are often very limited in application (e.g. can only be used by investors paying taxes in the state) and are only available to companies located, and doing business, in that particular state. Not to mention, state taxes rates are significantly lower than federal rates making the overall benefit of these state-level incentives much less than if they were offered on a federal level. CONFIDENTIALITY STATEMENT This message and all attachments are covered by The Electronic Communications Privacy Act, 18 USC secs. 2510-21. The matters are confidential and may be protected by the attorney-client and other privileges. Any review, use, dissemination, forwarding, printing, copying, disclosure or distribution by persons other than the intended recipients is prohibited and may be unlawful. You must delete this message and any copy (in any form) without disclosing it. If you believe this message has been sent to you in error, please notify the sender by replying to this transmission or by calling Michael Fugler 212-631 7770 (collect). Unless expressly stated in this email, nothing in this message should be construed as a digital or electronic within the meaning of Electronic Signatures in the Global and National Commerce Act or any other law of similar import, including without limitation, the Uniform Electronic Transactions Act, as the same may be enacted in any State. Thank you for your cooperation. CIRCULAR 230 DISCLOSURE Michael Fugler does not give tax advice. However, in order to comply with Treasury Department regulations, we must inform you that any advice contained in this communication (including any attachments) that may be construed as tax advice is not intended or written to be used, and cannot be used, for the purpose of avoiding penalties that may be imposed under the Internal Revenue Code or any other applicable tax law, or for promoting, marketing or recommending to another party and transaction, arrangement, or other matter. There is no intent to solicit or sell a security of any kind in this communication. The information contained in this message is intended only for the recipient, and may be a confidential attorney-client communication or may otherwise be privileged and confidential and protected from disclosure. If the reader of this message is not the intended recipient, or an employee or agent responsible for delivering this message to the intended recipient, please be aware that any dissemination or copying of this communication is strictly prohibited. If you have received this communication in error, please immediately notify us by replying to the message and deleting it from your computer.